This is probably the longest I've gone between posts. I really should just sit down and write, instead of thinking about writing. We're clearing Antorus every week. I guess now we're just waiting for the next expansion. The officers are trying to get a taste of Mythic, but we just don't have the numbers. Even our heroic runs usually only have around 18 people. I finally got Trion's website to work. The adblocker I run was interfering with their payment provider. 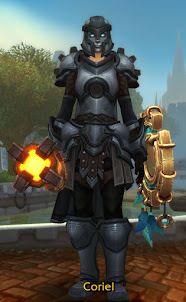 I signed up for a package, and have been leveling a Guardian Warrior. Hopefully I will go into it in more detail in a future post. But by and large, pretty much everything I said when I first tried Rift still holds. Which does make sense, as it is a Prime server. But that also means that the reasons I stopped playing Rift before are going to cause me to stop playing Rift now. Otherwise I'm not really playing anything. I guess Bless Online is coming out shortly, maybe I will give that a whirl.